Visiting Professor in Food Science &Technology, University of Reading, UK. Visiting Professor in Human Nutrition, Oxford Brookes University,UK. Whetherdiet plays a major role in heart disease is a question thatinterests us all. Author Ravnskov has a mission: To inform hisreaders that there is a side to this question other than the viewusually presented to us..
of heartdisease. If only people would do what they are advised – reducetheir intake of fats – then the high toll of death and disabilityfrom this disease could be readily reduced. If only! Dr.Ravnskov´s contention is that the diet-heart idea is a house built on sand.He leads us through the history of the concept in an interesting andreadable way. His writing clearly demonstrates the enormous depth and rangeof his reading on this subject. Step by step he examines the evidence forthe diet-heart idea, and step by step he shows us how that evidence may beflawed or contradicted by other research that is rarely acknowledged orquoted. Medicalscience has generally been highly regarded by the public, who have rarelyquestioned its findings. 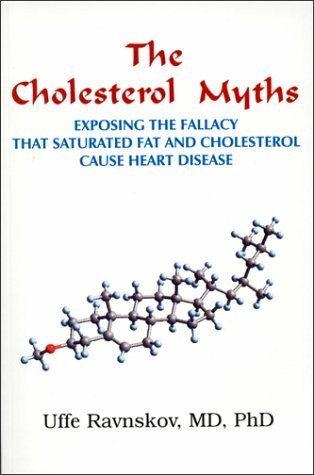 It will come as a surprise to many readers to learnhow many studies were poorly designed and conducted; how many did notproduce the results that have been claimed for them and have been quotedirrelevantly or misleadingly; and how many published studies exist whoseresults seriously question or contradict the diet-heart idea but are neveracknowledged or quoted. Some of these tactics are not only just misleadingbut also sometimes amount to scientific fraud. Manywith establishment views will regard Dr. Ravnskov as a crank. That would bea grave mistake. He has done his homework, he is not a lone voice in thewilderness, and he deserves to be taken seriously. Above all, this book willmake us all think more deeply about the true role of die tin heart diseaseand about the quality of the information that we receive.